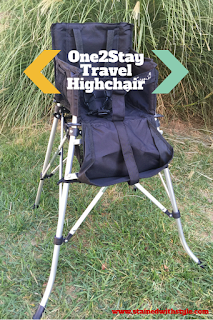 One2Stay Travel High Chair: Need it or Leave it? I love baby gear. Have I said that before? Well crap, I suppose I have. Sigh. When Ashley from WanderSnappers approached me about doing a review of the One2Stay travel highchair I basically leapt through the screen and screamed, "YES!" But that sounds desperate so I did a much cooler version of that. Anywhoo, I waited patiently for it to arrive (remember, I'm being cool) and I was not disappointed. It looks, and is about the weight of a standard camp chair. It would be easy to throw it into the back of the car for a camping trip, vacation or a trip to Grandma's house. The set up is simple (as you can see in the video) and requires separating the legs a bit, pushing down on the two levers to lock it, and then fastening the elastic loops to hold the footrest in place. That's it. It took me about 10 seconds. The One2Stay chair is high enough to sit at your standard height table (awesome) and because it doesn't come with a tray, that's pretty much necessary. It has a very cool mesh basket underneath that is sizable enough to store all the meal-time gear. I really love a good basket! The highchair is suitable (according to Fem) from 6 months until 33 pounds. As you can see from the video, it will accommodate an older child easily! Caution: the video is rough! The kidlets are, ahem, challenging to video around. Overall I would say that this is a pretty easy to use, lightweight highchair for travel. If you are in the market- go for it! The One2Stay is primarily in the European Market and is new to the United States, but I'm sure it will be widely available soon.